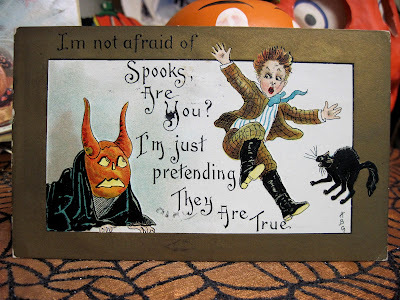 to wrap up this year's October posts. 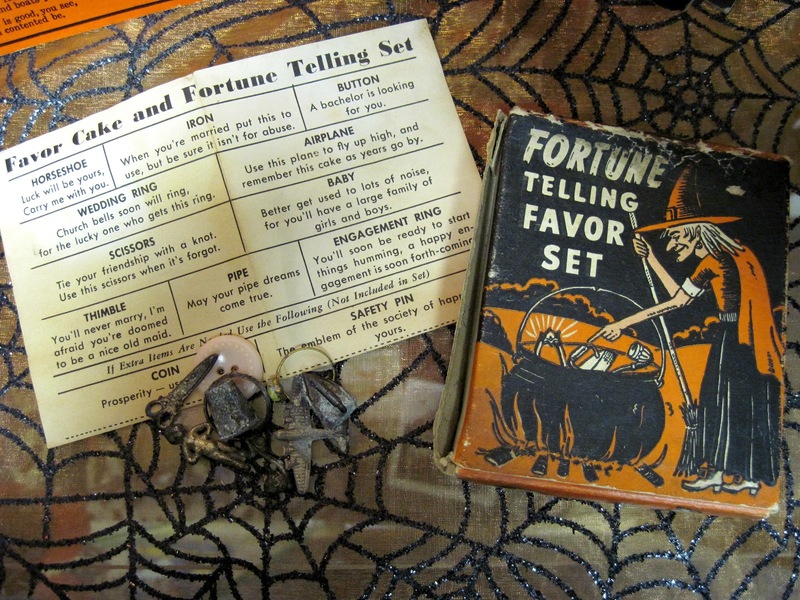 These fortune telling charms were typically hidden in slices of cake at parties and were a favorite Victorian holiday custom; this set is circa the 1940s. If the recipient managed to not swallow the charm, they could look up its fortune on the enclosed sheet. 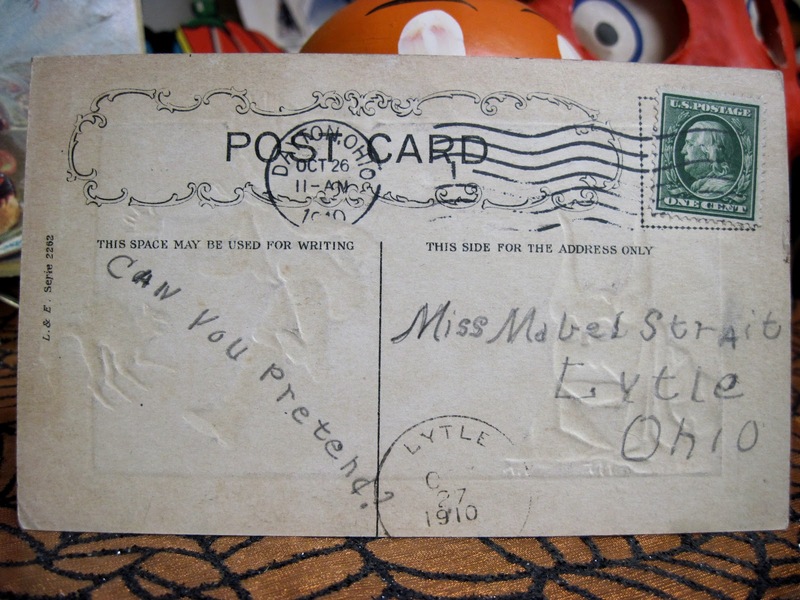 The thimble meant you'd be an old maid, the button indicated a bachelor was looking for you, and the baby predicted...well, babies. These charms look like they've seen a lot of cakes. 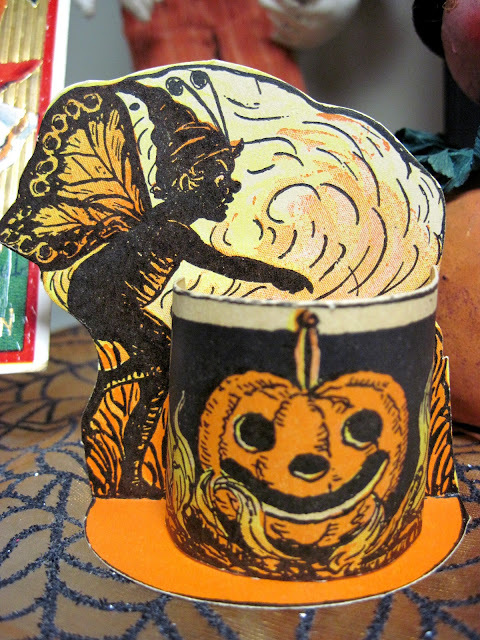 This delicate paper nut cup was made in the 1920s. and was one item in a set of party supplies featuring this fairy design. 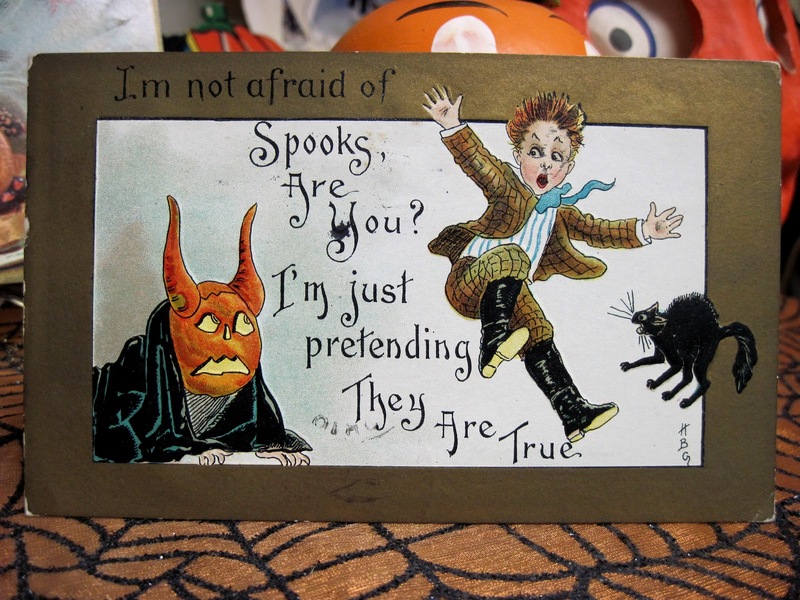 "I'm not afraid of Spooks, are you? Here's another amazing survivor of Halloweens past: this cardboard and tissue paper lantern. Made in the 1920s, it was intended to hold a real candle inside, just like the papier mache and pulp jack o' lanterns posted earlier. 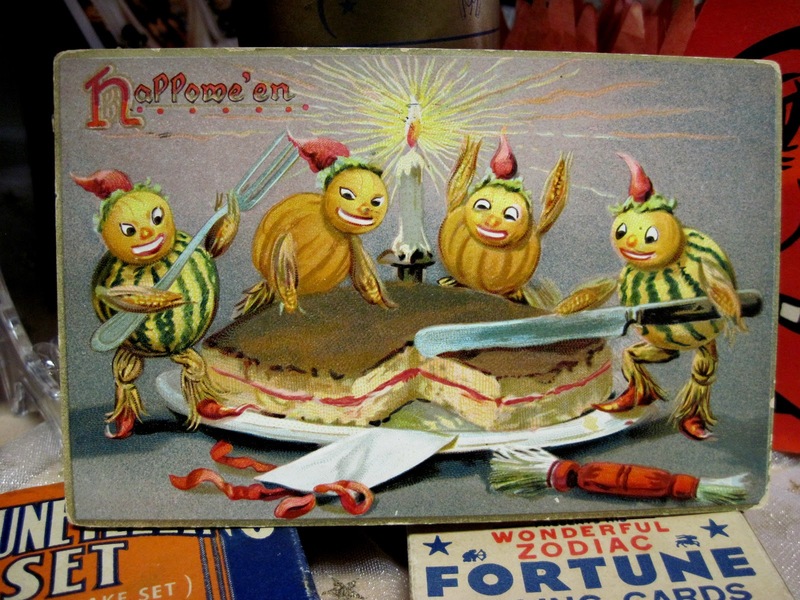 This one was used, but somehow managed to not burst into flames. Although ghosts have long been a staple feature of stories traditionally told at Halloween time, for some reason they do not appear often in old decorations, novelties, or postcards associated with the holiday. 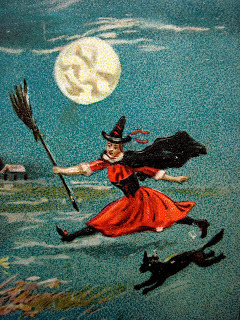 This one is a rare example, dating from around 1910.
and the tiny witch flying past the moon. 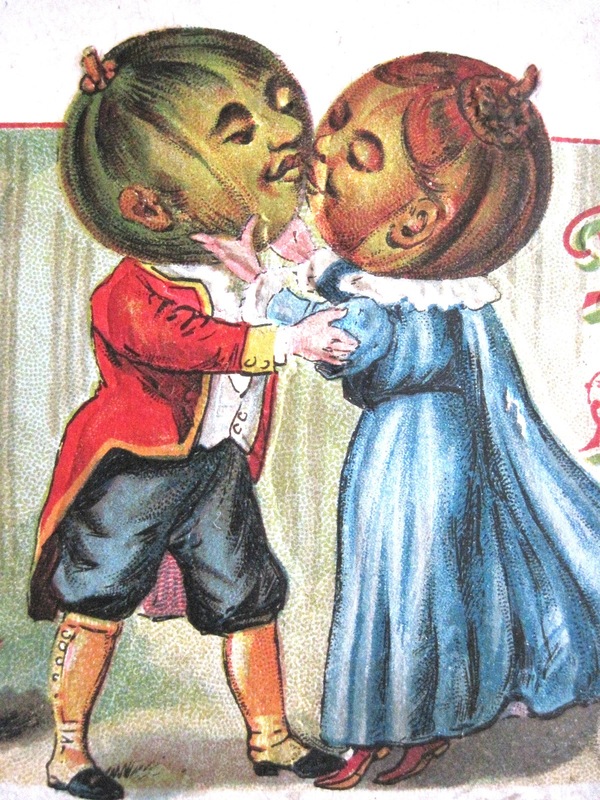 My very favorite antique Halloween postcards feature these little gourd guys, printed by Raphael Tuck and mailed between 1908 and 1909.
of the moon & witch! 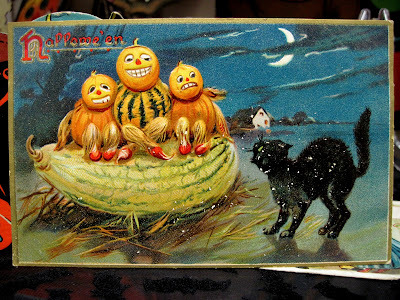 Here, the gourd guys have reached relative safety atop a large squash. 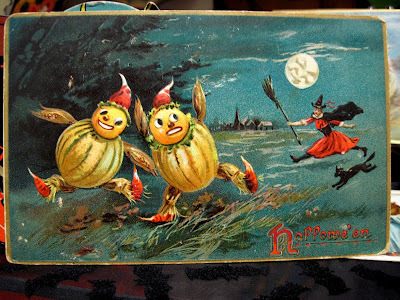 Finally, they make it home where a Halloween party cake awaits. 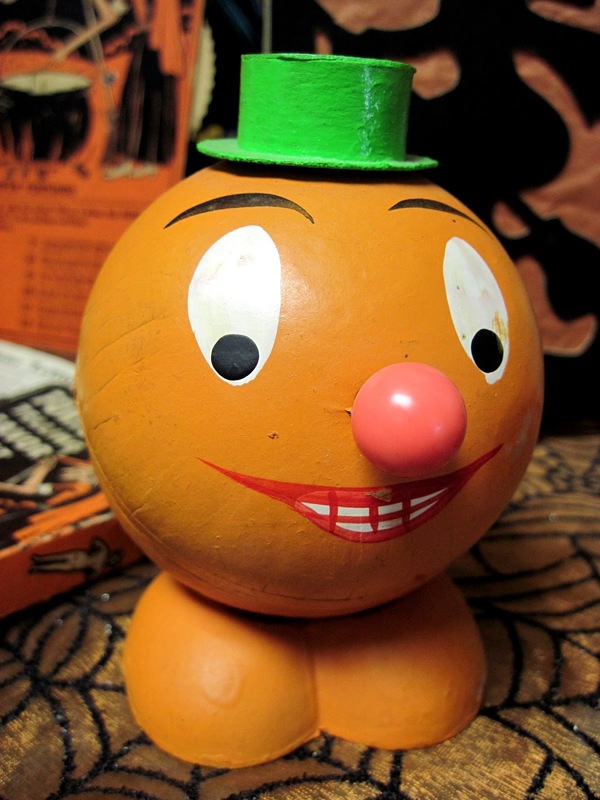 Here's a jolly looking jack o' lantern, a candy container made in West Germany around the late 1950s. 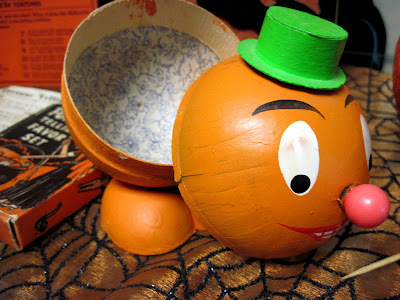 Just 4 1/2 inches tall, he's made of molded cardboard and opens at the center, providing a space for small candies. The candies are long gone, but here's where they were. Candy containers of this type were exported from Germany for over 100 years, and they were made for many holidays, including Christmas and Easter. There are collectors who specialize in candy containers, and entire guidebooks are devoted to them. 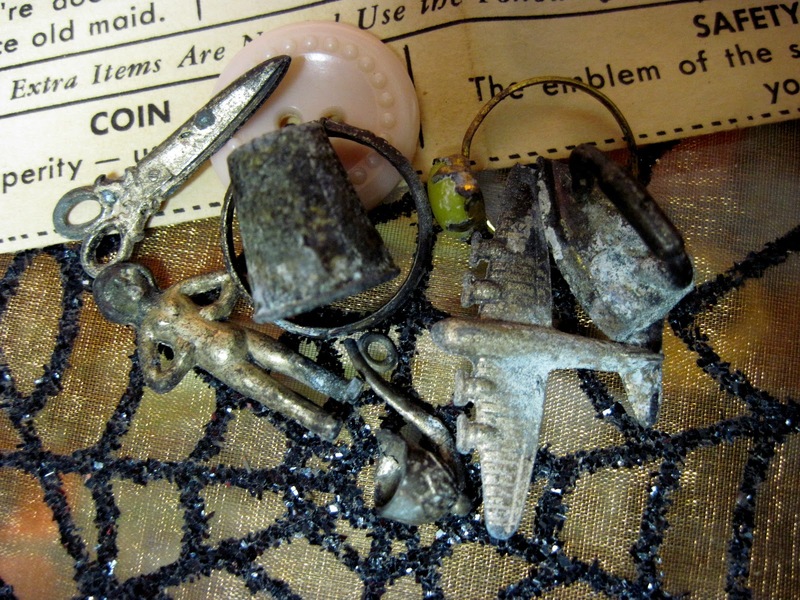 They're a fun collectible, although their fragile and disposable nature makes them a challenge to find today. 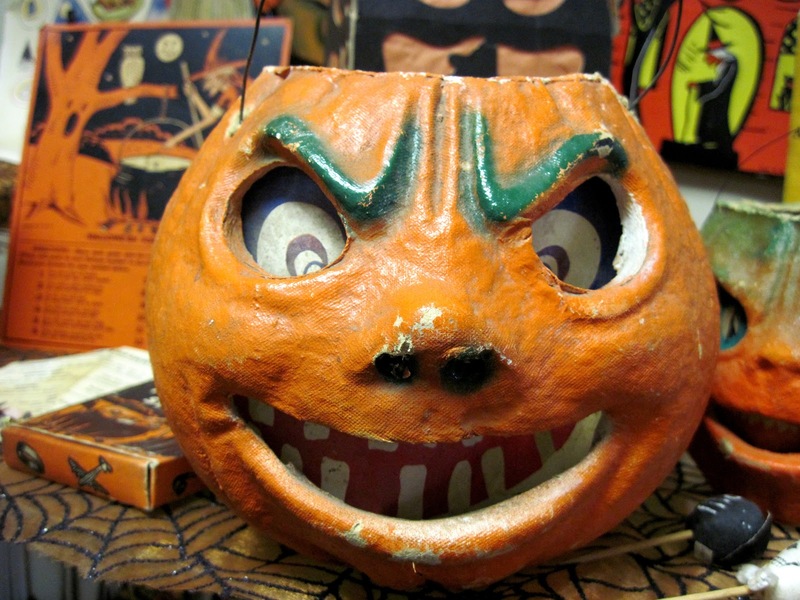 Here's another vintage Halloween jack o' lantern from my collection. 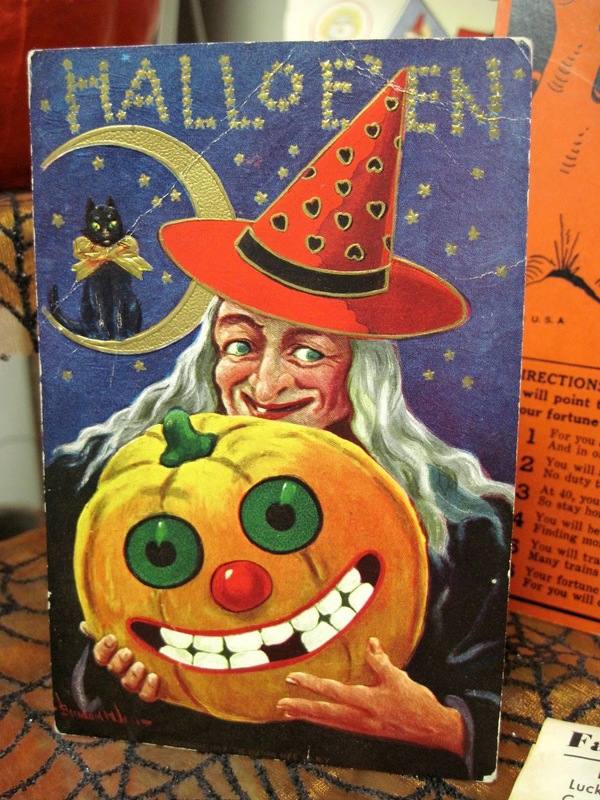 This one was made in the United States in the early 1940s, and is of a pulp/composition material. 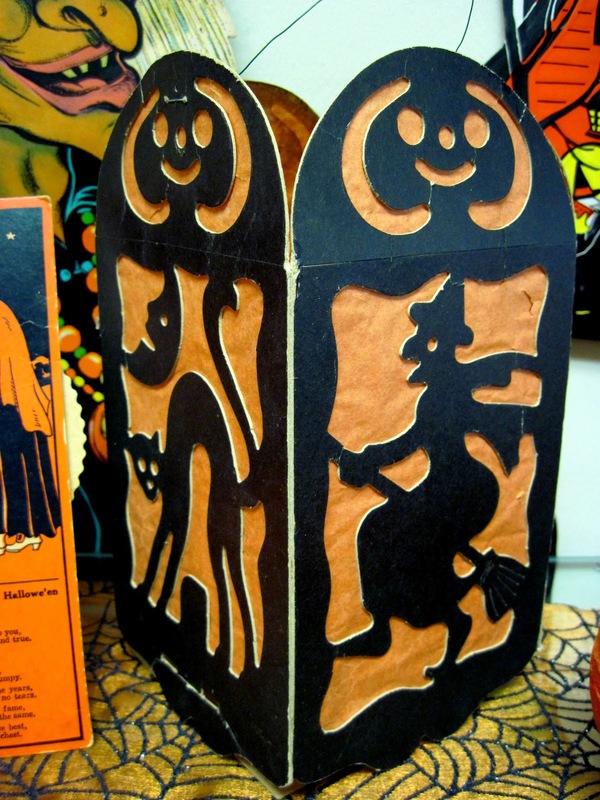 6 inches tall, it still has its original paper face insert, and was clearly used: there is melted candle wax and sooty residue inside. 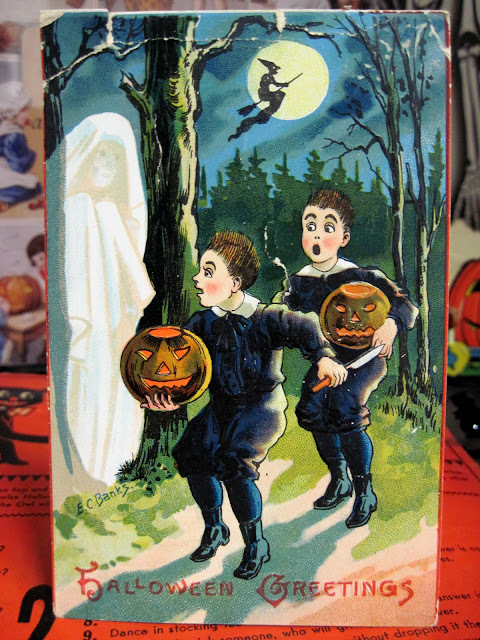 Its amazing that these fragile lanterns still survive to enchant us today! 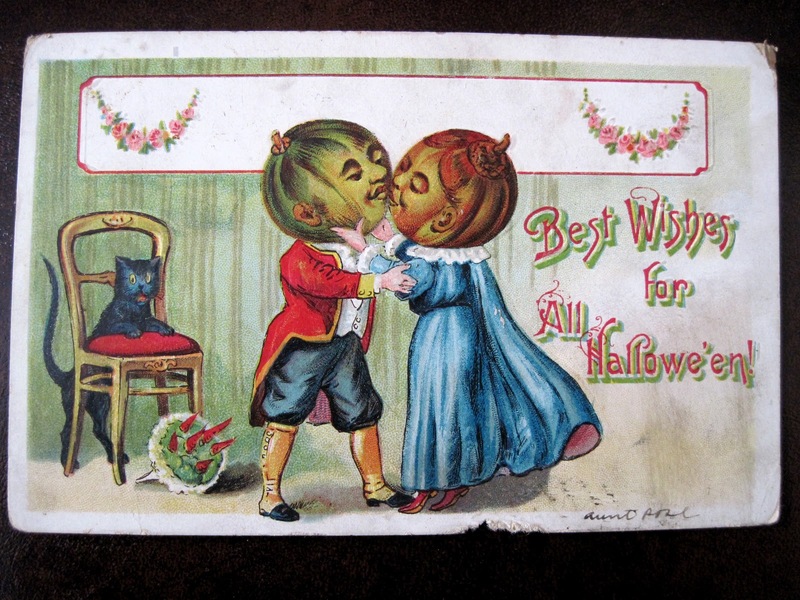 This antique Halloween postcard is one of my all time favorites. The pumpkin head girl is so detailed: note her teeny tiny gold teeth, and the black cats on her dress. 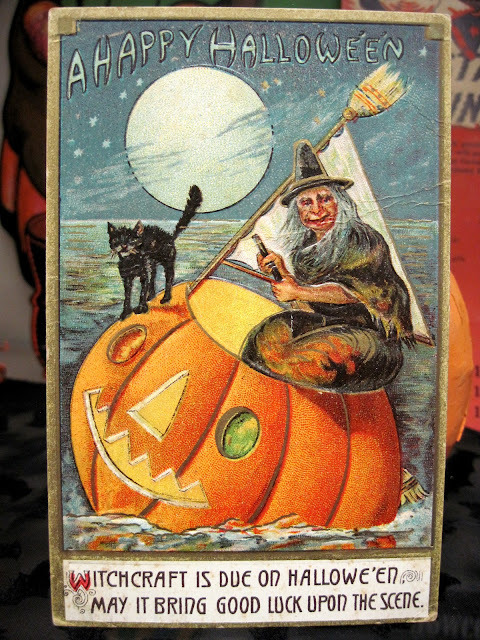 This fabulous character was mailed in October 1912 from Wahoo, Nebraska. 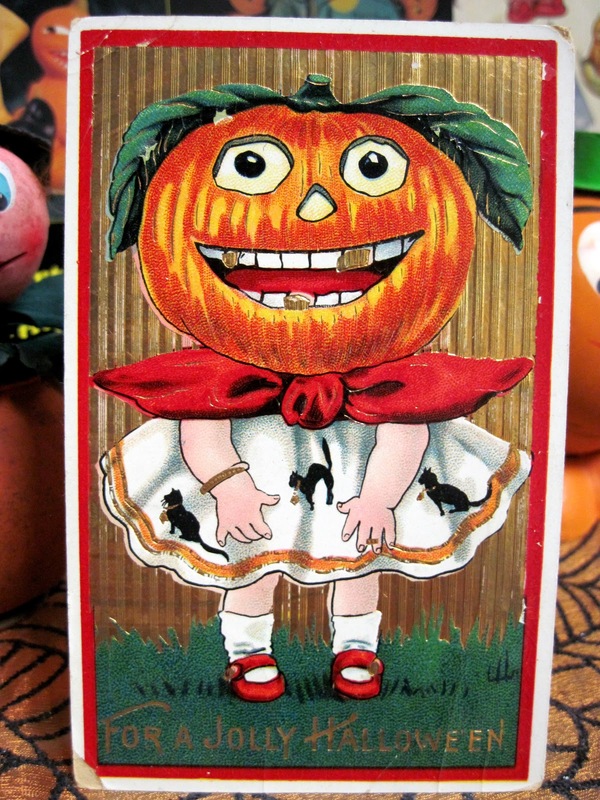 This little 1920s German jack o' lantern measures 3 3/4 inches tall. In delicate, all original condition, he's one of my favorite Halloween pieces. These types of lanterns were made in the thousands some 80 years ago, but their fragility, along with the fact that they were intended to be used with real candles inside, makes them scarce today.